This is my first taste of Amber Argyle’s writing. When I heard Witch Song was free right now, I downloaded the first book in the series then jumped ahead to the third, Witch Fall for the tour. This one is meant as a prequel, or standalone, so the order can be reverse the way I approached the series. Amber is a master at world building! Witch Song, set in an Asian empire, which I am assuming would be much like Japan or China, is the tale of Lilette. A girl who has lost everything she loves, including her family, and somehow survives a shipwreck. She finds home on a remote island and is about to be married to the father of her best friend, the chief of the tribe. Women in this book don’t have much say in the matters of marriage, bethrothal, and concubines. Their plight is one I struggled with as well as some of the darker elements. But Lilette is a persistent fighter and she is bound to find a way out when she’s kidnapped by the enemy, an elite, a royal prince with a brutal edge. 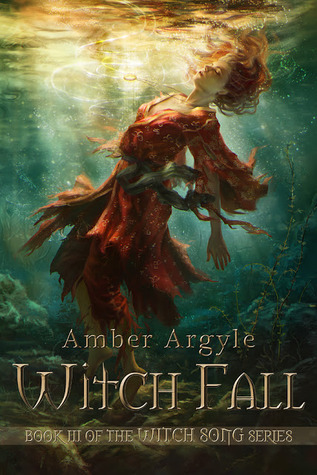 A tale of espionage, fantasy and magic, Witch Fall has eloquent writing with detail and lots of action. Can Lilette learn to trust those who she knows from her childhood? Can she remember her song of the Creator and save the destruction of her people? All balance has been lost by rulers seeking power and Lilette is the key to saving them. Content: Witch Fall packs a punch… literally. If you have a weak stomach for violence (as I do), you may want to bow out. Recommended for mature teens or adults. To see other content highlight here: threat of sexual abuse, violence against women, lots of death by sword, sensuality. One ebook copy of Witch Fall. Open internationally. I’m glad you mentioned the Asian inspired world. It was such fun to read about ancient China and come up with so many fun ideas for the background. Thanks for the review! Amber- I lived in Japan for a summer so it was fun to read and imagine all the Asian influences. You have a way with detail! I have not heard if this series but it sounds good and the covers are really pretty. I’m going to have to read them! Go for it! The first one, Witch Song is free right now. She had the covers commissioned so they are original works of art!